I am bored so I redid my LJ layout and what not...I made it all white and nice...then I realized, I can save energy by making it black...that's why there's blackle after all. So that's the only reason the thing's all black...I'm not goth or emo or whatever. I'd rather it be colorful and bright. I still haven't heard from Garry and I'm afraid to call him. Maybe he's working on homework? I don't know...I don't trust that he will turn his phone off when it needs to be off, so I'm afraid I'll call him in the middle of him working and cost him his job. I know...we're both paranoid like that. I know, I know...this entry was fairly pointless. I'm addicted to updating. 2/20/08 03:48 pm - Job? I think Garry got a job? I'm horribly confused! I went to his myspace and waaay down at the bottom it says the company he supposedly works for and "cashier". ?? But I don't have any voice mails, no messages on yahoo or myspace...no "omg yay I have a job! "...I know my Garry. He would tell me as soon as he possibly could...and I don't know where he is or if he's working at this job that I don't even know if he has. I hope he contacts me tonight sometime...I know he has school later. It would be nice if he got the job...he really, really needs it, but it will also cut back the time we have together which doesn't make me happy. I just have mixed feelings about it, is all. Today was our first full day of school in 2 weeks...as you can imagine it dragged on for EVERYONE. I'm really not in a typing mood now...I'm horribly bored though. I want to appologize for my entry yesterday. I was just in a terrible mood as I have been off and on for the last few days. It felt like I was PMSing but I know that can't be it...so I'm 98% sure it has almost everything to do with the lack of schooling. It all makes me fear the summer, to be perfectly honest. If I can get the guts and save the money I wanna ask mom if I can go to California for a little bit (like a week or less) and look at colleges and spend time with Garry. I know the longer I wait to ask the harder it will be for me to ask...but I am terrified to ask. Anyways, I fear the summer...if this amount of schooling in this last month or so has put me on such an emotional roller coaster I can only imagine how terrible I'll be come this summer. Meh, on a lighter and much less important note, Gwen and Helix got married last night. It was a very strange day...very strange. They basically did a LOT of talking...within an hour of confessing their love for one another, Helix returned to the heavens and made their wedding official so they wouldn't have to wait around to bump into a priest. That's basically what it was like...I enjoyed it though. I keep feeling like I have to be at musical practice. I feel like due to the snow days and what not he would have made everyone be there for the blocking but on the schedule it only said that people who were in 9, 10, and 11 had to be there...and I'm not in any of them. I checked the announcements too and there wasn't anything about it there. So...I have the house to myself. Grandma left today after being here for about a month...Emily gets discharged from the hospital today (which is why she left). I love my grandma, I really do, but I'm kinda happy she went back home. She's not familiar with our routine and she cannot hear crap...neither can mom. I also like the feeling of independence I get without having an adult looking over me every second of every day. I'm really getting tired of it...I know I'm only 17, but I am old enough to think for myself, despite what mom or grandma think. They're all so incredibly negative. That's one thing I get sick of...is people being negative and complaining all the time and then when I do it they say I'm being "emo" and I need to stop complaining. People (including myself) are such hypocrites. We voted on the place and theme of prom today. I was amazed at how little teens think for themselves today. Basically pages were ripped out of these prom books of themes...there were SO many beautiful ones...Italian, French, Night, Paris, even a Phantom one...but almost everyone voted for the Casino/Las Vegas theme. Most didn't know what they were even voting for...each paper had a number on it. People wrote down 6 (the Casino one) just because they were told to. I personally think there should have been a prom committee established and let just THOSE people vote on the theme, place, time, ect. I know there are Juniors who wrote some random thing down, wrote down whatever, and didn't care cause they're not going anyways. I know no matter what I am going to enjoy myself simply because I will have the most amazing guy there with me...yet it would be nice if we actually had a prom that was beautiful and not....flashy. I don't know what it's officially going to be, yet. 2/18/08 06:01 pm - Gaaa! I'm in such a bad mood right now. I have very little rhyme or reason for it...I know a big majority of it is the lack of being at school for so long. But I'm horribly restless, bored, and just...want to pull my hair out kind of feeling. I was in an okay mood before I went to go eat..then mom and Justin kept asking stupid questions and doing annoying things. Then my mood plunged downhill. One of the annoying things about Garry being so far away is the fact that I cannot just spend a day with him. The days we have off are filled with chores, work, school, homework, projects, running people places, needing to go somewhere...yet every day we have off I get hopeful that we'll get to do nothing but sit around and hang out with one another. I know this is a very childish hope, but I'm not used to this adult way of life. I'm not used to having work and being with someone who works. I know it's a way of life, I really do...but it is also annoying. If we were in person this would be so much easier. I know though that in a few months all of this won't matter anymore and I will get those 24/7 moments with him. I want to cuddle with him, talk with him, rp with him...I just want time with him. He left at 1:30pm and it is now 6:00pm...and I have not heard from him since he left. I'm also frusterated about school. You get all this time off and it's not healthy for me to sit around and have nothing to do. Yet I don't want to do things either...I don't want to do work or homework or go to practices. I don't want to do anything but sit around and when I'm sitting around I don't want to do anything but work. It's like one vicious cycle and it's driving me mad. And to top it all off I'm getting annoyed with LJ, again. Can't anyone understand me? Am I speaking a different language or am I just not clear? I sit here pouring out my heart for anyone to listen...anyone to give me feedback, good or bad...and I can bet if I didn't have this here I'd get comments like, "I hate it when I have to do chores too." What kind of comment is that? I'm sitting here telling you all that I miss Garry and I feel like I'm stuck between a rock and a hard place. I'm so sick of trying to make everyone understand how sick I am of things...how EXCITED I am for things (believe it or not, I do have some happy entries in here), about things that are important to me..about things that make me happy and feel alive...about things that annoy me. You're all sitting here reading me. Yet, as my life has always been, I don't get taken seriously...I get written off for being a whiner who has nothing important to complain about. I get shoved aside and left some silly little comment just to leave a comment...if I get a comment at all. Basically, I want people to hear me and no matter how hard I try I am STILL being ignored. Yet despite it all I'm going to keep my LJ going. I want to keep writing in this the day I go to college, the day I am proposed to, the day I get married, the day I have my first child, the day I have any children following, the day I get my first real job, the day I graduate college (this isn't in any order lol), the day I quit or get fired, the day my children have their sweet 16...I want this to be here to see it all, comments or not. I'm sitting here in dad's room with Cody while Justin and dad haul the dry wall up to the room beside the one I'm in. I went to the store with dad and got the stuff...I got the easier end of the deal. And dad's putting his amazing cooking skills to work and making this amazing chicken and, as he told me, these French potato type things that are amazing. I can't wait to try it all...dad is so awesome. I was writing in my diary on the way here (which I haven't done for awhile and really need to do every day) and I have come to the conclusion that everyone in my family really annoys me but dad. He doesn't assume he knows me and doesn't expect me to know myself yet. He's really trying hard to get to know ME and not the person he wants me to be...and he's helping me find out who I am as well. I know he cooked this chicken and potatoes because he knows I'm interested in trying new foods. Mom, on the other hand, told me yesterday that for every out of state college I look at I have to look at one in state college and one of them HAS to be Bluffton. Bluffton is my worst nightmare. Bluffton is a Mennonite College in Ohio. And I'm so sick of getting mail from Mennonite colleges...for the PSAT I took they didn't have the option of Athiesm, so I put "other". Stupid me put "Mennonite" on the PACT when I was a freshman or Sophomore so now I get all these Mennonite colleges trying to contact me. I really just wanna go out to California even for a week and spend some time with Garry and look at some colleges around there, just so I can get an idea. I don't even have to be in the same place as Garry let alone the same school (well duh, he's in an art institute and I don't want to be a chef). I just want to be near him and go to a nice school that will make me feel alive. I'm sick of my mother. Luckily dad wouldn't make me go to some Mennonite College. I'm REALLY in the mood to RP with Helix and Gwen now...but this computer doesn't have Furc on it and Garry's not online. Hopefully this A-team meeting will go by quickly so I can get home and talk to him on the phone or online or something. I'm very clingy to him lately...maybe it's because I know he'll be here soon and the idea thrills me. We are the dearest couple I know (other than Amanda and Ari...I don't know Dana and Phil well but I'm sure they're a beautiful couple as well). Yesterday Garry and I decided to bring Helix and Gwen back to life. I had wanted to bring Gwen back for awhile now...I stopped playing her because I broke it off with Gregg and he played Syte who was the father of the child Gwen was carrying and her to be husband. For obvious reasons I decided not to play her anymore. Yet she's the one I'm most comfortable playing...and most confident playing as well. The poor soul has been dragged through mud, crap, and everything between in her life and she reflected my life in very disturbing ways. I came to find now that I was just with the wrong people. Syte and Nacka made Gwen's life miserable and they expected her to be little miss sunshine about it. Gregg and Kyrihe treated me like crap and expected me to be little miss sunshine about it. Then they'd complain about me being emo and complaining all the time. Ironic, hu? Complaining about complaining. But yeah...apparently Nacka brought Helix back to kill Gwen, Gwen's baby, and Syte. Apparently Nacka then started to hit on Helix and so he killed her in return before hunting down Gwen. Yesterday he finally found Gwen and sliced her up real nice. He wasn't very skilled with his giant sword (nobadthoughts) which was good news for Gwen. He was fairly clumsy with it, to be honest...couldn't get a nice shot at her. He did manage to cut her elbow, forearm, and side. Eventually she gave up and told him that he could kill her, she didn't really have anything to live for anyways. Helix was JUST about to kill her when he found out that Gwen had a miscarriage and Syte had left her...at which point his furious flame went out. His whole character softened and he began to panic once realizing that Gwen was becoming horribly faint and glazed over due to the blood loss. He bandaged her up and held her close, totally unfamiliar with those types of emotions. That's where we left off...but it will be a very interesting and fun journey :D and I'm thrilled they're back. They are the essence of Garry and I...the whole reason we ever met. So then last night at about 1 or 2 in the morning Garry called me and we talked on the phone until about 4:30...and I had to get up today at 8:40. *sigh* I had to go to church and then I walked home...I then I have to go to dad's house and help him put up dry wall (blah) and then I get to go to the A-team meeting. I REALLY do not want to go, but I have to. I really just want to get this day over with as soon as I can. I'm going to go take a nap...we don't have school tomorrow so I can stay up tonight and sleep in tomorrow. Yay! I was in a strangely horrible mood yesterday. I don't even know why...I felt like I was PMSing but I know that's not possible. Mom took me to the mall before I went to voice lessons and I hate clothes shopping with her. Our styles are horrendously different and mom LOVES to pick up the worst looking shirt or shoe and ask me if it's something I like. I'm not 13. I'm 17. I can pick out my OWN clothes. She loves to do that...it's aggravating. So that didn't help me at all...in fact everything mom did REALLY annoyed me yesterday. Then trying on clothes made me realize that I HATE my legs...they're horrible. And my knees...I think it's just the mirrors though. So I got home and got online and talked to Garry...telling him how I feel and why I was upset. It didn't make him too happy but he ended up calling me and making me feel better in the end. I was up until about 1 AM last night. 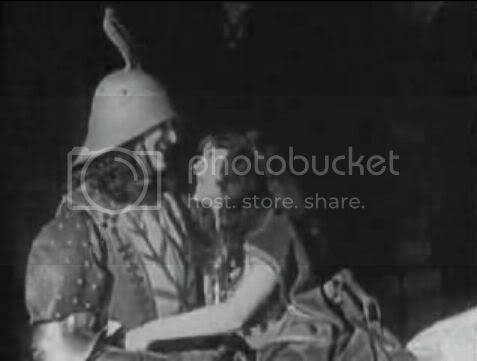 I was watching the 1923 version of Hunchback of Notre Dame. It was entertaining but the ending was so messed up. I love 20's movies, however...so much overacting it's amusing! But they had to do that...how else do you get a message across without using your voice? I have the A-team meeting tomorrow *sighs heavily* I really don't wanna go. 2/15/08 09:58 am - Bored. I'm so bored! I went to bed early last night because I was so tired from the whole school day (with a 2 hour delay, mind you) and 2 hour musical practice. (Pathetic, I know) Garry and I didn't do anything special yesterday but he wasn't feeling too well and I was at school and then a few hours later he went to school. So we talked on the phone for a few hours or so. Today neither of us have school and the only thing I need to do is get some books at the library and go to voice lessons at 8. So hopefully we'll get to spend some time together today :). Either way, I think the biggest gift of all was getting those tickets. Only 76 more days left! Yes, I have a count down going and I'm crossing off each day of my calander before I go to bed. I actually remember to do that...but it's hanging right where I can see it all the time. *dances* We're gunna have such an awesome time and finally I'll get to do like what Amanda does and post pictures of my Garry and I together being weird but awesome! I've always wanted to do that :) May can't come soon enough! I should watch Disney movies or something. 2/13/08 05:49 pm - Their secret's out! Is there something they would like to tell us? 2/13/08 09:34 am - Another. So...mom woke me up this morning and notified me that we have ANOTHER snow day today. So, as of now we only have school one day this week. It's nice...but annoying.